Sonos has announced that it is bringing Alexa control to its multi-room lineup. Thanks to the beta, which available as an update starting today, users will be able to speak to an Amazon Echo speaker and use it to play music on their Sonos speakers. You'll be able to instruct Alexa to play music in specific rooms, and also control music playback directly. To get Alexa working with an existing Sonos speaker, you'll need a separate Amazon Echo speaker to listen to your voice commands. Alexa support has been long promised by the audio company, after it first announced it was working on it last year. More recently, a change to Sonos's privacy statement suggested the announcement was on its way soon. We're looking forward to trying out Alexa control on our Sonos speakers when the Beta launches later today. Sonos also used its presentation to announce that its lineup will shortly be receiving AirPlay 2 support, allowing you to stream music directly from your iOS device to a single or multiple speakers, and will also allow you to control your Sonos speakers using Siri. Alongside Alexa support, the Sonos app is also getting an upgrade. The new version will allow you to more easily group together rooms for playing songs on the fly. 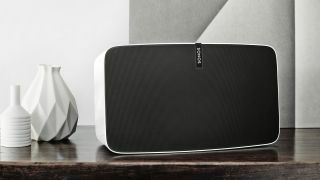 Sonos also announced that it was building an open smart home platform to allow different connected devices to talk to each other. It claims this is in an effort to build the 'Sonic Internet'. A 'Works with Sonos' certification badge will be applied to products which fully support the new standard. The platform is set to launch fully in 2018, with the developer portal launching today. These are the best Sonos deals available right now.